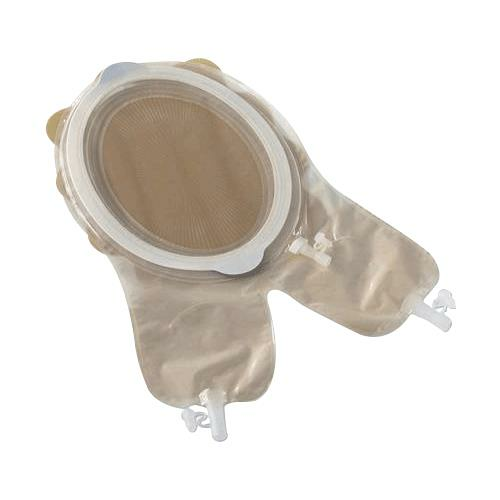 Coloplast Two-Piece Cut-To-Fit Fistula And Wound Management System is an all-in-one pouching system to manage abdominal fistulas, providing patients with a comfortable solution while saving nurses time. It is designed with a flexible adhesive. The pouch conforms to unique abdominal contours and molds to the skin with ease. Double-layer adhesive is flexible and long lasting, and protects the skin from drainage. Tracing guide is designed to increase accuracy in cutting fistula or wound pattern. - The Coloplast Fistula and Wound Management System is easy to use. Simply follow the steps to learn how to apply this system with your patients. - Apply the transparent cover over the wound and fistula. - Place the tracing guide over the fistula/wound and trace the edge onto the tracing guide. - Position the guide on the back of the adhesive. Bend the tracing guide slightly at the dashed line and remove the small release liner. - Adhere the tracing guide on the back of the adhesive. Cut the adhesive according to the trace/pattern. - Close the outlet spouts and peel off the backing of the adhesive. Apply the Fistula and Wound Management System. - Using the spigot positioned on the coupling, inflate the ring with the blue pump. - Position and adhere the Drain Port to the lid. Turn over the lid and cut a hole in the lid under the center of the Drain Port. - Lubricate the catheter with water and twist through. Make sure the Drain Port collar is pressed all the way into the Drain Port. - Position the lid on the landing zone. Remove the paper backing from the lid and position the lid on the landing zone. - If connecting the Fistula Drainage Bag, only cut tube according to the markings for correct length. Open one of the spouts and press it all the way into the tube.